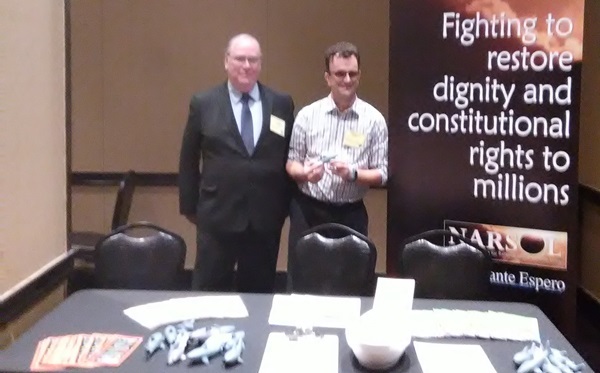 NARSOL’s team drew a prime location for its display and interacted with approximately 100 attendees, mostly attorneys, but investigators and other exhibitors also showed interest. Those who signed up for further contact and a chance to win a free registration at the next 11th NARSOL National Conference in Houston June 7 – 9 are from states around the country as well as from Canada. Among the attorneys were some who litigate plaintiff civil rights cases, which is the object of NARSOL’s Scarlet Legal Action Project. The toy sharks touting SLAP and the newly-enhanced “You Can Win” sheet showing statutory attorneys’ fees awards in successful cases were especially popular with the attendees. This conference is but one example of your donations at work. Connections made carry over into our advocacy in that we are building our network of attorneys. This topic contains 1 reply, has 2 voices, and was last updated by Paul Peatry 3 months, 1 week ago. I would like to know if you could have a agg. Criminal sexual abuse case reversed do to no proof and was falsely accused? There was a false police report and I was forced to signed a confession. Never had a background before this, and I can barely feed my family now. I can’t get a job, need your help. I have all the proof and witnesses you need. Nice to see you here. What state you in? I’m a cheesehead, smack on Illinois’ border tween the two.. I demanded a jury trial for the assault in 1992. 1 day deal, I’d no clue who did it tho, IDK, but she said she thought it was me, but whatever went down they found nothing. So why did the mom try to apologize the night before I left for Waupon. Quite a scene that was. 1210 days in for another’s doing and still doing ( his) paper. “An indeterminate term not to exceed 5 five years consecutively,” altered to life time SOR in the dark. It seems a five year commitment required due process, but the life term.. not so much. Wasn’t present that day; my lawyer neither..as if. DNA or biological evidence , none! + testimony of a clean up by the mom. Asked for alibi defense he had me account on paper, easy enough I worked a lot but the time frame was difficullt. Hard to prove the negative. Juries tend to hedge toward victim, naturally. What is weird the they justified one thing and a bait and switch occurred, pathological necessity to loddy, doddy, & everybody. That was the play all along. Scapegoats for electronic Surveillance Saints ….nuff said.